Some sports stories are just meant to be told to a wider audience than their dedicated fan base. Red Army is more than just a mere 'story'. It also encompasses the social and historic climates which bred the conditions for the rise of this sport to something of major national pride. Indeed, Kiwi's can totally relate to the Soviet mindset. Think of the iconic status Rugby has on the New Zealand psyche. Hard to imagine the All Blacks position being downgraded anytime soon. In retelling a story of this nature, it also helps a director if you have interviewees who have interesting stories to tell, and these people are reasonably interesting subjects themselves. Director Gabe Polsky struck gold by focusing mainly on one of the five key players who, when playing together, were both feared and revered whenever they played. Captain Vaicheslav (Slava) Fetisov is an absolute riot, with his blunt and candid ruminations on just why they were so damn good. You don't get too many interviewees who interrupt filming to take a personal phone call on their mobile - and then give the middle finger when the beleaguered directors asks them (not entirely unreasonably!) to focus on the task at hand. Slava reveals that amongst the seriously brutal training regime imposed on them, the team also studied ballet, dance and chess to gain disciplines and insights they could then utilize in their quest for continued improvement and match winning consistency. Watching period era footage is a thing of wonder as these magnificent warriors glided, danced, and weaved their spellbinding magic on a hockey field many times over. Indeed, when they compare to the American style of playing, the differences couldn't be more stark. The Yanks prefer to use violence and intimidation to bludgeon the opposition into submission. Well, that's the way they illustrate that point, fair or not. The end result of having a sports team being world champions is the rise in the national mood as the successful results continually serve to remind the country of how great your nation is, and when your country is a communist state, well propaganda pretty much writes itself. 'Ha! Soviet system produces only winners! Pathetic Capitalism!' The Communist Party wasn't slow to highlight this fact whenever the opportunity presented itself either. 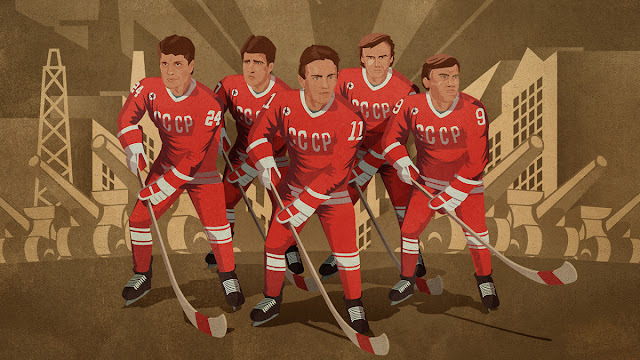 Yet again, Red Army is another outstanding documentary that rises well above the confines of its genre, and delivers a story that is both massively entertaining and informative.